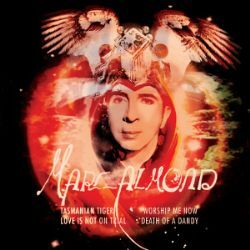 Marc Almond is back with a brand new 4-track EP, featuring a plethora of excellent ‘friends’ including Jarvis Cocker (Pulp) and Carl Barat (The Libertines, Dirty Pretty Things). Following the successful experience with double A single ‘Burn Bright/The Dancing Marquis’, legendaryproducer Tony Visconti (Bowie, T-Rex, The Moody Blues, Morrissey) is also back working alongside Marc. Next to producer Tris Penna, Visconti lends a helping hand on string arrangements and mixing duties for the opening track, ‘Tasmanian Tiger’, and ‘Death of a Dandy’, the latter inspired by the recent death of Soho’s tragic artist Sebastian Horsley and featuring special guest Danielz from T-Rex tribute ‘T.Rextasy’. Jarvis Cocker brings to the mix an infectious electro-pop number he wrote for the occasion, ‘Worship Me Now’, where he also features on backing vocals and takes care of production with Jason Buckle (All Seeing I). Completing the excellent recording, ‘Love Is Not On Trial’ sees Almond continuing his collaboration with Carl Barat, his co-star in the 2012 opera ‘Poppea’ at Theatre du Chatelet in Paris. Produced again by Tris Penna, the song was written especially for Marc by Carl, who also features on guitar and vocals. The eclectic 4 track EP is available on a strictly limited edition turquoise coloured 7″ vinyl in a beautifully designed gatefold sleeve, complete with a CD of the same four songs.